It's so nice to have you visit today, and I hope you enjoy this sweet little tag set I created using some more of the wonderful products found at Really Reasonable Ribbon, including a few of the trims found in this month's awesome Ribbon Club Assortment. It's fun to demonstrate just how much pizzazz you can give your projects by adding some simple trims. 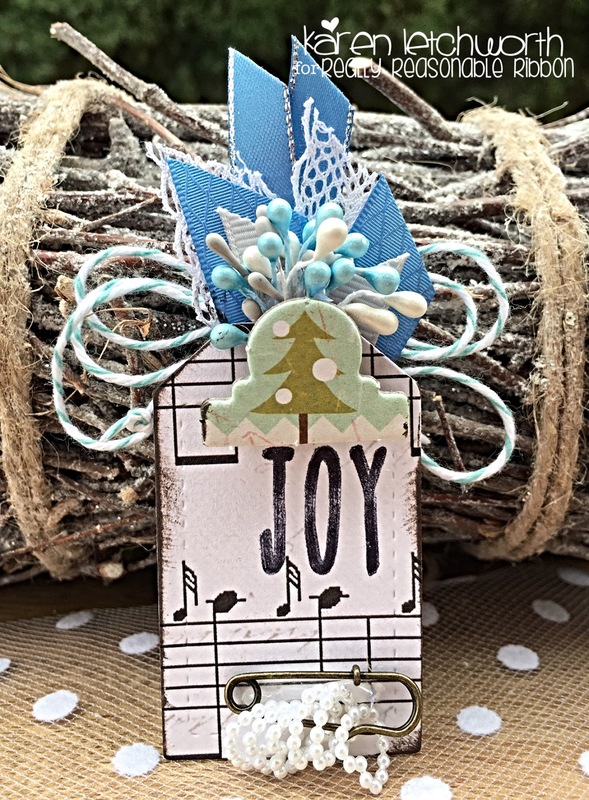 I cut small pieces of ribbon from the Ribbon Club Assortment to give my tag that POP of fun it needed. Once I had cut my tag and pieced together my patterned papers with Scor-Tape, the ribbons really gave this little tag the perfect "finishing touch". From the Ribbon Club Assortment, I used a piece of White Crochet Lace, 5/8" Porcelain Diamond Satin, 3/8" Snowflake on Silver Grosgrain, and 3/8" Porcelain Satin With Silver Edge. I also tucked in some Aqua Baker's Twine, White Double-Head Stamens, Baby Blue Double-Head Stamens, and a piece of chipboard. 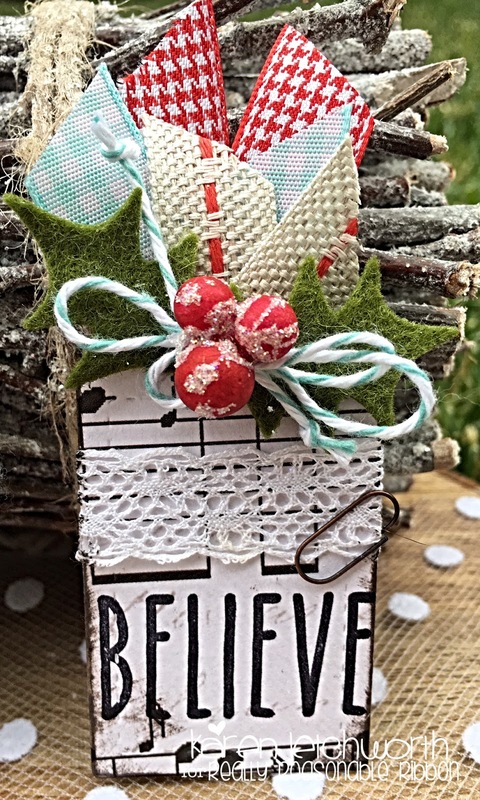 Each of the sentiments that were stamped on my three tags (Love, Hope, Believe) are from a set called Merry. At the very bottom, I attached a Tim Holtz pin which displays several sweet 11mm White Heart-Shaped Flatback Pearl Beads. For my second tag, I used the same concept; but this time I attached different ribbons to its tail end including a length of White Crochet Lace, 3/8" Red Gingham and Center-Stitch Turquoise Burlap. I tucked in some Miniature Red Double-Head Stamens and several Miniature White Double-Head Stamens. I also attached a Red Open End Rose and a Tim Holtz pin holding several 11mm White Heart-Shaped Flatback Pearl Beads. 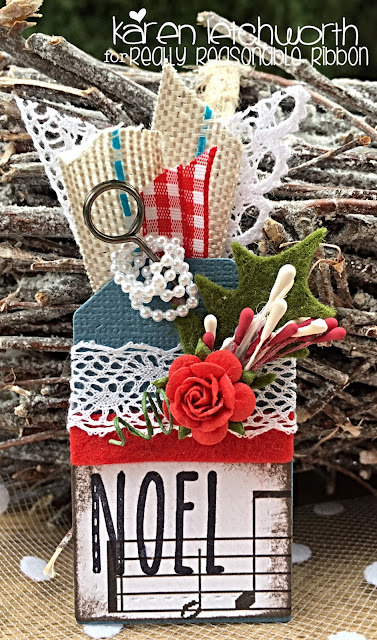 My third and final tag is quite similar in style, but is adorned with lengths of Red Center-Stitch Burlap, Aqua Plaid Ribbon and Red/White Houndstooth Plaid Ribbon. If I forgot to mention this, each of my tags has a piece of the sweet White Crochet Lace found in this month's Ribbon Club Assortment (there's usually one lace per collection) so that's yet another great thing about the Ribbon Club, is that you're always stocked with all the perfect laces, ribbons and trims for every occasion. 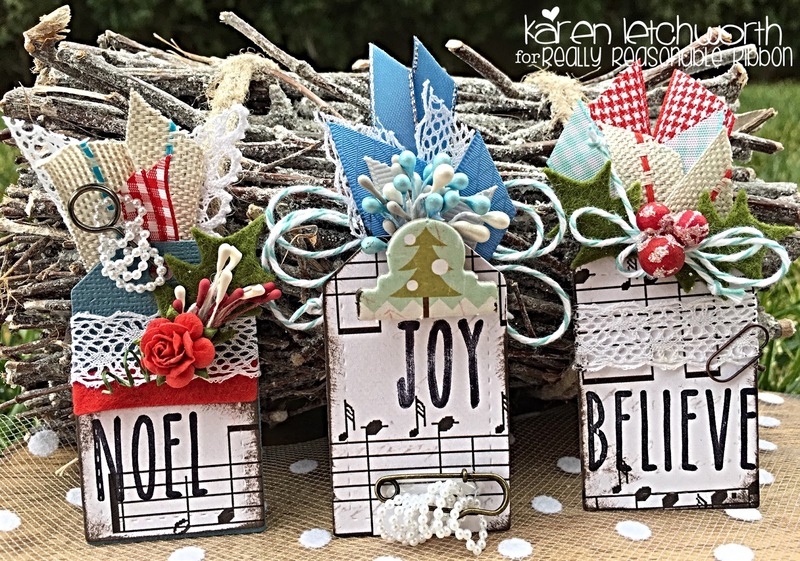 I really hope that these three simple tags I've shared have helped you see just how much pizzazz and fun you can add to any project with a few fun trims and supplies from Really Reasonable Ribbon. Thanks so much for stopping by, and don't forget the RRR December Blog Hop starting tomorrow! ChouxChoux Paper Arts - Lori Hairston's Visions of Sugarplums Challenge #2 - Home For Christmas - These tags are actually going "home" (to my childhood home) to Minnesota on the Christmas gifts for my parents. I just LOVE adding handmade tags to Christmas packages, and these ones are actually going "Home For Christmas". 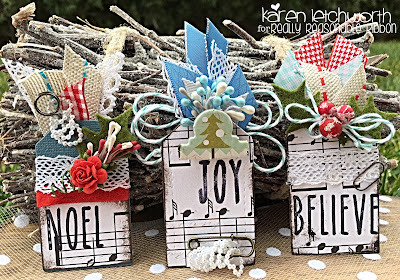 Beautiful beautiful tags Karen - you really are a talented artist when using ribbon! Karen, these tags are so beautiful! I love all the ribbon and other elements you have used on the black and white paper! Beautiful tags and gorgeous ribbons! So glad you linked to my Visions of Sugarplums challenge! Such beautiful tags!! Happy Holiday!! So pretty, Karen! These are a gift all by themselves. My tongue is hanging out like that emoji because these are tantalizing ribbons and trims! Am in love with all of your fabulous tags!! !